Stop Healthcare Tax Petition makes ballot, breaks record! SALEM, OR. — Today, the Stop Healthcare Taxes Referendum 301 chief petitioners qualified 82,312 signatures with a record-setting 85.43% validity rate for the January 23rd, 2018 special election to let voters vote on healthcare sales taxes passed by the legislature and signed into law by Governor Kate Brown. Under Oregon’s constitutional referendum laws, legislation passed without an emergency clause or bills that raise revenue can be challenged by gathering petition signatures. This year, the required number of signatures for submission was 58,789. 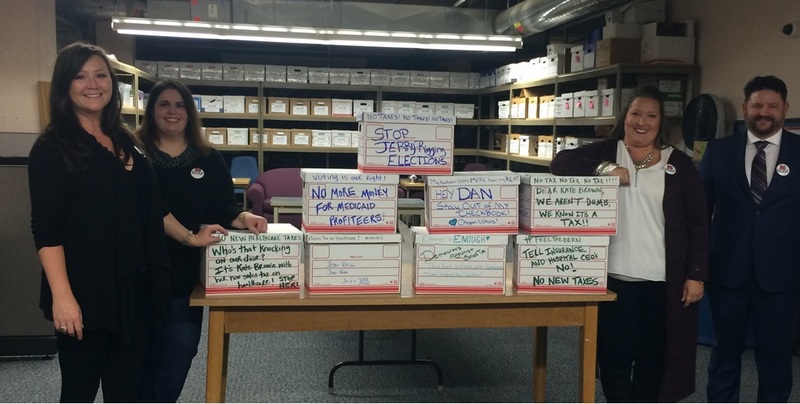 The majority of the 84,367 petition signatures submitted for Referendum 301 were gathered via volunteer circulators. Representative Sal Esquivel (R-Medford) said he believes the Democratic Party agenda is out of step with the values of every day Oregonians. “I think the successful results of this petition effort shows just what Oregonians really think about what kind of job politicians are doing, and they aren’t very happy with the bills coming out of Salem.” Esquivel specifically pointed to new laws like mandatory universal abortion coverage paid for with state tax dollars, and providing health insurance to non-US citizens while failing to fully-fund voter-approved measures for education and veterans.